“Grass!” At the same moment, several people had shouted out the answer. What was the question, you ask? “What’s the largest agricultural crop in Marin County?” “Grass!” cried the chorus. And no, no one meant that kind of grass. We were talking about the green stuff that cows love to chew…the luscious green that grows all over West Marin County. About 20 of us had climbed aboard a big bio-diesel bus parked outside Gather Restaurant in Berkeley to be joined by another 20 or so artisanal organic cheese lovers in Larkspur. Our plan? 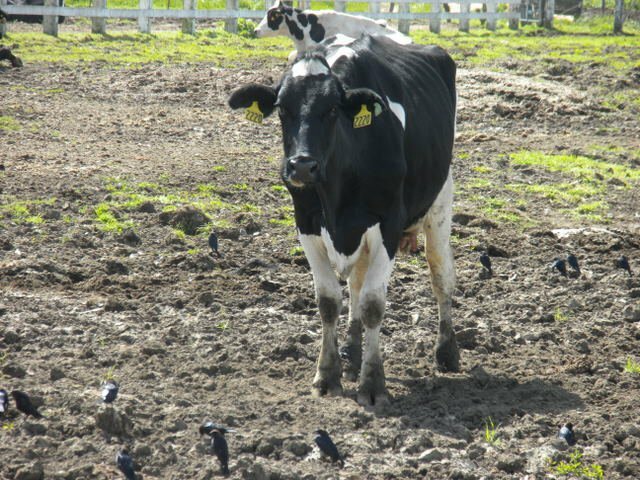 Spend the day touring three very special dairy farms in West Marin and South Sonoma Counties. And thus began our Marin Artisan Organic Cheese Tour, organized by Bay Area Green Tours in collaboration with The Marin Agricultural Land Trust. Or, as we shall call them henceforth, MALT. First stop, Lafranchi Ranch just outside Nicasio. This dairy was founded in 1919 by the Lafranchis and has remained in the hands of this Swiss-American family ever since. Randy Lafranchi, in charge of day-to-day operations, kindly gave us a tour. Brothers Rick and Scott handle off-site management issues and there are three sisters who are silent partners in the business. The ranch is home to some 400 cows and 75% of the herd produces organic milk. The black-and-white Holsteins looked content grazing out in the open fields, awaiting their next milking, scheduled at 2 p.m. and 2 a.m. daily. In order to produce organic milk, each cow consumes 40 gallons of water and 45 pounds of high-nutritive feed each day! The end-product of that consumption fertilizes the pastures in a never-ending cycle of life. In 2010, inspired by their Swiss heritage and carefully learned European cheese-making techniques, the family expanded into artisan cheese making. They now produce six varieties of cheese in a pristine facility right on the property. Our small group especially enjoyed the super fresh Foggy Morning cheese! Yum! 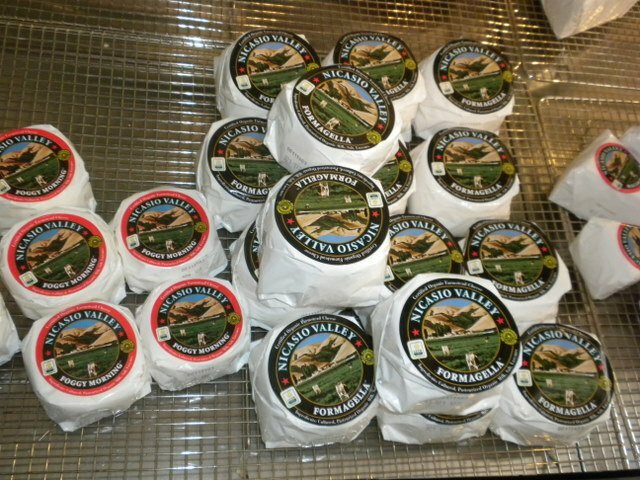 You can taste and buy Nicasio Valley Cheese and other gourmet goodies at the creamery. It’s open Thursday through Sunday from 10 a.m.–5 p.m. Nicasio is also distributed locally―visit the Nicasio websiteto see a list of retail stores. Well-fed with delicious fresh cheese, we climbed back on the bus. After a relaxing 45- minute stop at the Marin French Cheese company, we picnicked on the spacious grounds at our next destination, the Toluma Farms Goat Dairy in Tomales. I have to tell you―the Toluma goats are soooo cute! Toluma Farms is owned and operated by Dr. David Jablons and Tamara Hicks, along with their two girls, Josy and Emmy. He mentioned a few times the need to keep his day job, as the restoration of the buildings and grounds has been capital intensive. David’s day job? Chief of Thoracic Surgery at UCSF Medical Center. Dr. Jablons is a world-renowned expert on lung cancer and in addition to his many accomplishments, he is a very funny man who kept us entertained as he explained the day-to-day operations of his family’s goat farm. David led us on a tour of his milking operation, barn and grounds. He told us that they had purchased the land in 2003 and spent their first several years on total land restoration in collaboration with NRCS, The STRAW Project, Marin Organic Certified Agriculture and Marin RCD. Toluma Farms currently has 200 goats and began milking operations in June 2007. As you might expect from a surgeon, the barn and milking facility were spotless, although David attributed that to his herd manager, Eric Butler, who, David says, is obsessed with cleanliness. The goats certainly looked well-fed, clean and content. And did I mention the marvelously cute and playful baby goats? Next on the agenda for Toluma Farms is a creamery where they’ll make goat cheese. At the end of this informative and inspiring tour, David handed out samples of Redwood Hill Farm’s yogurt, made with Toluma Farms goat milk. Super delicious! Everyone immediately put it on their shopping list! Although it was hard to leave the idyllic setting of Toluma Farms, we got back on the bus and headed to our final destination, Barinaga Ranch. Enjoyed by all: the gorgeous green countryside that rolled by outside our windows as we made our way to the ranch. 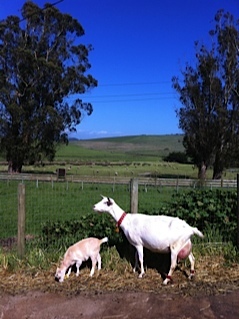 Barinaga Ranch is an 800-acre organic sheep dairy and creamery in Marshall, on the east shore of Tomales Bay. It’s owned and operated by Marcia Barinaga and her husband, Corey. It turns out that Marcia’s roots are deep in sheep ranching; her grandfather traveled from a village in the Basque country to Idaho in the early 1900s to make his life as sheep herder and then rancher. Marcia left a career as a science journalist to return to her shepherd roots. Her deep love and enthusiasm for her new life and her sheep was palpable. Her passion was evident in her every word as she lovingly described life on the ranch. Marcia produces her cheese from the raw sheep’s milk in the tradition of her Basque roots. Barinaga Ranch’s first year of cheese production was 2009 and last year they were up to 3,000 pounds and she was able to take on a cheese-making assistant. She generously allowed us to sample one of the last exemplars of this season’s cheese production and it was terrific―carefully balanced and rich on the palette! Marcia is rightfully proud of the humane and caring way they raise sheep and offers no apology for raising them to benefit our extraordinary local food economy. Her cheese is distributed by Cowgirl Creamery and she had a delivery of lambs scheduled the next day to Quince Restaurant. These three passionate farming operations are part of the growing specialty cheese business in the North Bay. The great news is that these cheese businesses help preserve historical dairies that are an integral part of the North Bay’s rich agricultural heritage. This post would be incomplete without mentioning the impact that MALT has made on preserving agricultural lands for farming. Scott Lafranchi told us that were it not for the efforts of MALT, the Lafranchi Ranch might not exist today. MALT was the first land trust in the U.S. to focus on farmland preservation. MALT was founded in 1980 by a coalition of ranchers and environmentalists to preserve farmland in Marin County. We learned their work is done by acquiring agricultural conservation easements on farmland in voluntary transactions with the landowners. In many cases, MALT infuses desperately needed capital to keep agricultural operations afloat and/or to help family members buy one another out to keep longstanding farms going. It’s pretty evident that if it wasn’t for MALT, West Marin County would not be the gorgeous and inspiring agricultural landscape it is today, an expanse relatively untouched by development and inspiring our amazing food culture. When you’re there, it’s hard to believe that just over the hill is a major metropolis. We are very fortunate! Many thanks to Bay Area Green Tours for organizing these inspiring tours to educate the public about these local farms that need our support to survive! It’s a wonderful way to spend a memorable and nourishing day in the country! Taking the Mystery Out of Wines from Burgundy, France.